The Spanish Basque Country will delight any visitor. It is famous for its colorful fishing villages, sandy beaches and dramatic scenery along its coast as well as for cities such as Bilbao, with Frank Gehry’s striking architectural landmark, the Guggenheim Modern Art Museum. With its own flag, language and culture, the Basque Country has a different feel than the rest of Spain and should be put on your “must see” travel list. The rugged Basque coastline on the Bay of Biscay in Northeast Spain, with cliffs that plunge into the pounding surf, is dotted with traditional small villages as well as resort towns known for their spectacular beaches and some of the best surfing in Europe. During our cruise aboard the Seven Seas Explorer, we had an over night stay in the port city of Getxo, a lovely seaside town about 15 minutes from Bilbao, Spain. Over the course of a day and a half, we visited Bilbao and several other nearby towns in the Spanish Basque Country. Riding along the coast, our first stop was to see San Juan de Gaztelugatxe, a small chapel perched on top of a tiny island. For the physically fit, you can reach the chapel by crossing a long stone footbridge and then climbing a couple hundred steep steps up the rocky island. If you are a Game of Thrones fan, you might recognize it as “Dragonstone”. 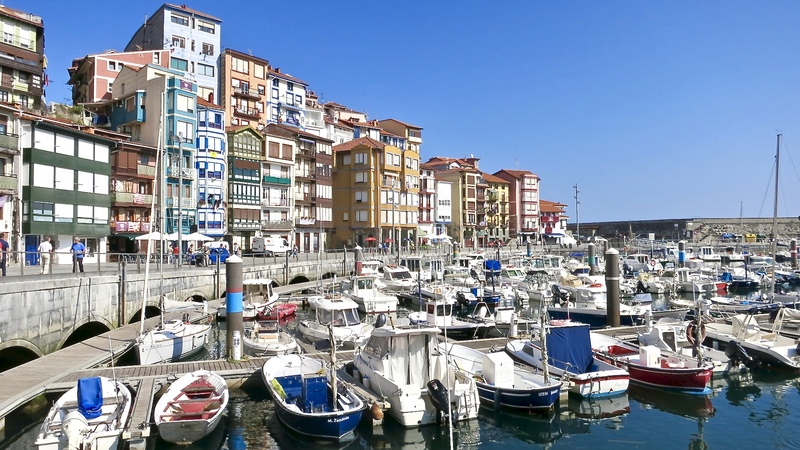 Bermeo is one of the Basque Country’s most important fishing ports. The picturesque old port has colorful narrow houses that overlook the boats in the harbor. Many are now bars where the locals stop for a drink and a pintxo (similar to tapas). In the main square, there is a pretty gazebo, the town hall and the Santa Maria Church. At the top of town, you find the Ercilla Tower which is now the Fisherman’s Museum. The former capital of ancient Vizcaya, Gernika/Guernica was our next stop. Unfortunately it is best known for a tragic bombing event that destroyed a large portion of the town during the Spanish Civil War. Casa de Juntas, its assembly house, and an oak tree survived the bombing and are now symbols of Basque’s political history. The bombing was later immortalized by Pablo Picasso in one of his most famous paintings, the huge black and white mural called “Guernica”. After our tour, we visited 1000 Kolorau, a restaurant that specializes in fresh fish. 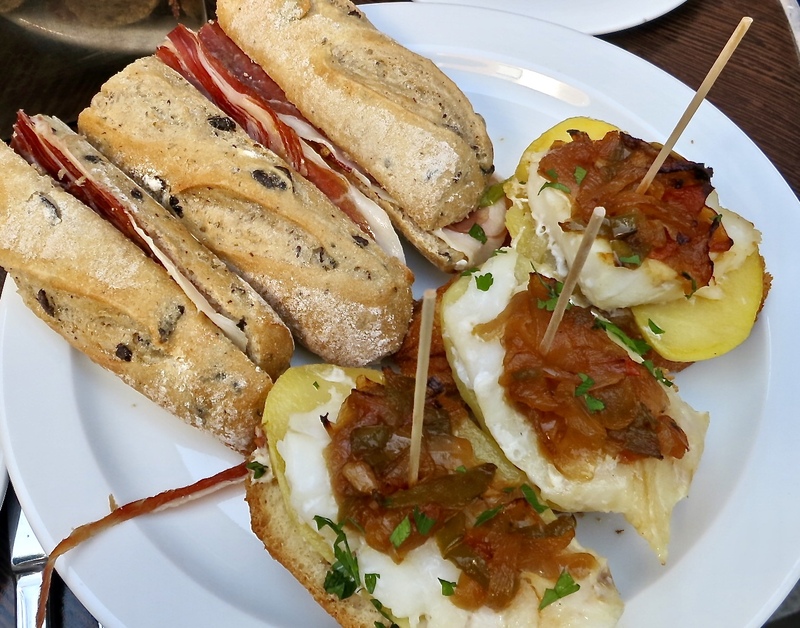 We sat outside on the shaded terrace and enjoyed glasses of Txakoli de Vizcaya, the most popular white wine in the Basque region along with pintxos of grilled octopus, bread topped with potatoes, bacalao and jamón and delicious olive rolls stuffed with jamón. While tapas are common in other parts of Spain, pintxos, which are generally smaller, are traditional snacks in the Spanish Basque Country. The following day we toured Bilbao. Our first stop was the Great Biscay Transporter Bridge built in 1893 by a student of Gustave Eiffel, the construction of which my husband found to be very interesting. It was destroyed during the Spanish Civil War but was rebuilt. It carries people and cars, across the river in an open gondola that hangs suspended from the bridge. From there we drove up to Mount Artxanda, one of the two mountains within the city limits, that offers wonderful views of Bilbao from its park. There is a huge fingerprint sculpture called “Huella Dactilar” which honors the many victims that were killed during the Spanish Civil War. Then it was on to the celebrated Guggenheim Modern Art Museum which is constructed of shimmering titanium, stone and glass. The museum is the most photographed structure in Bilbao. Outside the museum, the other popular spots for a photo is the enormous sculpture of “Puppy” which is covered in living flowers and the giant spider “Maman”. Although the Spanish Basque Country is not visited as much as other regions of Spain, it should be. With spectacular scenery of lush green mountains, rolling countryside and pristine beaches, good wine and delicious food found at both small pintxos bars and world famous Michelin starred restaurants, there is something for everyone. We loved the Basque Country and would love to return for a longer visit. The resort town of San Sebastian is at the top of our list as we missed it on this trip to Spain due to a last minute port change and it is a favorite of visitors to this region. This entry was posted in lifestyle, photography, travel, Uncategorized and tagged basque coast of spain, basque spain, Guggenheim museum, Spain, spanish Basque Country, spanish travel, travel to spain. Bookmark the permalink. Enjoyed reading this post Karen. I agree that part of Spain is not frequented as much as other parts. We were in Asturias this past summer, what a gorgeous part of Spain. Don’t you just love those wee villages? Thank you Loretta, I’m glad you enjoyed the post about the Basque Country and that it brought back memories of your trip to Spain this summer. This is definitely a part of Spain that we would like to return to and yes, the villages are charming. Hi Kay, I’m happy that my post brought back memories of your visit to the Basque Country. Yes, we do hope to return as we really want to visit San Sebastian. How I’d love to go to Spain. I really enjoyed reading this Karen. Hi Lea Ann, This was our first time in Spain and hopefully won’t be our last. I’m glad you enjoyed the post, thank you. I’m sure you had great food there – I believe they have more Michelin starred restaurants in País Vasco than anywhere else in the world. I was blown away just by the pinxos in San Sebastian – good food is their way of life. Can you believe it, Mad Dog…so much good food in such a small portion of Spain. The food alone should have people wanting to visit the Basque Country. We were very disappointed that we didn’t get to San Sebastian because of a weather related port change. I have some Basque friends and they all live to eat. The rest of Spain even makes jokes about their food obsession and the men have food clubs where they meet to cook and talk about food. It’s a good excuse to back again another year to visit San Sebastian – you could easily spend months dining out! Hi Diane, I do not prefer one way of traveling over another as they are very different and we will continue to do both in the future. My husband and I loved our cruise, so much so that we gave a deposit for another one on Regent within the next 2 years. It was all inclusive, meaning unless you bought something in the boutiques or booked a spa treatment, not one penny was billed to you. All food (not one bad meal), all drinks (top shelf liquor and champagne) and all tours were included. We chose to take bus tours that were offered free to visit outlying towns but there was the option of booking a private tour…we saw many private limos lined at the dock that couples had arranged or you could visit the port cities on your own. Our ship was small compared to many that we saw, there were only 750 passengers compared to some that hold as many as 6000. That means there were never long lines, any group we were with had about 20 people at most. I usually spend months planning our European trips and it was nice to have a break and let someone else do all the planning. On our next cruise, one thing I will do is to make sure about how much walking is involved. Some of the towns we visited on this trip had very steep streets which were hard for my husband as he has a balance problem from a past health issue that in now in remission. Hope that helps. Those photos are amazing! You definitely had a great time in Spain. Thank you Angie, for your nice compliment. We did enjoy Spain, it was our first visit but hopefully not our last. Looks and sounds like a wonderful place to spend the day, and that food looks scrumptious! Hi Ingrid, Our introduction into the Basque County was really nice and yes, the food was delicious. What a lovely area and you describe it so well. The food sounds amazing. What a beautiful place! Spain is on our list to visit next … hoping sometime in the next 12 months! Hi Judy, This was our first trip to Spain and we really enjoyed it. I’m sure you will have a great time on your visit. Hi Ronit, It really was a wonderful visit. I do hope you get to the Guggenheim in Bilbao. What a fun area to explore! Hi Pam, The Basque Country certainly does have a lot to offer. Hopefully we will get a chance to return and see more of the region. The Northern part of Spain is quite amazing. We spent some time in Asturias and loved it. Everyone who has been to Bilbao has enjoyed it a lot. Your tour looks great and your pictures are amazing! Thank you for your compliment Darlene. You are lucky living in Spain, there certainly are wonderful places for you to visit. We loved our visit to the area earlier this year, especially San Sebastián and Getaria. We were using public transport, which was a bit restrictive. Next time we will drive so we can see much more. Hi Debra, I do remember your visit. I especially was envious of your visit to the Balenziaga museum. It was one of the tours we could have taken but I knew my husband would rather see something else. As I mentioned, he loved learning about the construction of the Transporter Bridge in Bilbao. 😀 We are hoping to get back to Spain and drive through the Basque Country…San Sebastian is at the top of our list. Torontonian Frank Gehry designed the Bilbao. Coincidentally, I am just reading the book Origins which begins its adventure at the Bilbao in Spain. Definitely on my list for Spain which may be in the cards next year. Hi Eva, If you do get a chance to visit Spain next year, do put the Basque Country on your lists of stops. It is very different from the other parts of the country that we visited. This post was delightful. My brother and sister in law have been to Spain twice. I’ve often placed Spain and Greece at the top of my list when I finally get to travel to Europe. It’s great to know about areas and regions one might overlook so thank you for introducing us to Spanish Basque Country. So much history, the view of the mountains, and the picturesque fishing village truly sparked my interest! Thanks, Karen. Thank you for your kind words Jane, I’m glad that you enjoyed the post. I do hope that you get a chance to visit Europe and definitely put Spain on your list. The Basque Country and Barcelona are two places that we would like to visit again. I’d give anything, just anything to get to the Guggenheim in Bilbao ! Tho’ in Europe for trade exhibitions and other business affairs at least yearly for decades Spain did at the tine have little ‘drawing power’ . . . the so-called ‘bucket list’ having changed in the interim years just hope I have future opportunities; the Basque country and other parts of the NW for a variety of reasons having developed quite a drawing power . . . oh, your pintxos of octopus and jamon would have been right up my alley . . . It looks like you are doing a trip very similar to one we did a few years ago. In Basque country, I learned to like Crema Catalan a lot! Did you try it? Hi Linda, Being the world traveler that you are, that wouldn’t surprise me. 🙂 Oh yes, Crema Catalan is a real favorite…it is the perfect ending to a meal. Karen, these are beautiful photos of an area of Spain that I haven’t visited. I love exploring small villages. The Basque Country looks perfectly charming. Hi Pam, I do hope you get a chance to visit the Basque Country. I know we would love to return to visit more of the villages in the region. Just beautiful. I would just never go to a bullfight in that region. But your photos are spectacular! Thank you Mimi for your nice compliment. I’m glad that you enjoyed the photos from the Basque Country. oh it all sounds fabulous Karen! That flower covered “Puppy” wow! the pintxos sound incredible! It’s all so beautiful, so many wonderful colors and the museum I’m sure was fabulous! Hi Jenna, We had always wanted to visit the Basque Country and we are so very glad we did. I’m glad you enjoyed the post, thank you. Thank you Carolyn, I’m glad you enjoyed the post. really beautiful and lovely pictures !! hugs! I appreciate your nice compliment Gloria, thank you. Your travel posts always give me a case of wanderlust! A fab post Karen! What spectacular photos and views! Thank you Amy, I’m glad you enjoyed the photos from the Basque Country. HI Karen! I have been admiring your posts these pasts few weeks, but had trouble leaving a comment from my phone ( with Feedly).Very frustrating to say the least. Anyway, I LOVE every post from your trip! What a wonderful Cruise ship!! We don’t like cruises but since this one is first class, we may consider taking one, but only the Seven Seas Explorer as you recommended. Thank you for taking us on your fabulous trip to all the beautiful ports and cities you toured on. I love the French cooking class on board and sharing the Chicken Fines Herbes recipe. By the way, your photos are spectacular!! Thanks for sharing! Thank you so much Anna, for letting me know that you have enjoyed the posts about our cruise. I hope they help anyone who might be planning a holiday. We were very hesitant about this cruise before we left…my husband saying it would be our first and last. Boy has he had to tell a lot of people how wrong he was. I think it would be very hard to top our experience aboard the Seven Seas Explore as we loved everything about it. You are right, it is first class all the way. I’m sorry that you have had a problem leaving comments. I’ve had a similar experience on a lot of the blogs that I follow, mostly on Blogger. Hi Debra, You are right, everyone seems to love Spain…I know we would love to return. Gorgeous photos, the Basque Country is on my travel list! Thank you for your nice compliment Laura. I’m happy to know that you enjoyed my photos of the Basque Country. I do hope you get a chance to visit, we thought it was a wonderful place to visit. Oh, do go to San Sebastián. There are few things more fun than wandering from pintxo bar to pintxo bar. Hi Mél@nie, You are fortunate to live close by the Basque region of both France and Spain. We thought the regions were wonderful and hope to return. Oh, my… Spain has so much to show us. We have never been but dream of going. First, though I want to learn more Spanish. Second, I need to find the best time of year to go, as I know it gets mercilessly hot and humid there. Any thoughts? My favorite of the outdoor sculptures is the fingerprint! One must wonder whose it is! Hi David, I do hope the two of you go to Spain. We don’t speak Spanish and had no trouble as everyone we met spoke English. As far as weather, I think that the end of September and October are usually not as hot although Seville is the exception to the rule. We cancelled a tour there in late September as the temperature was 99. The temperature was fine everywhere else when we were there at the end of September. Haha – I just asked you about the weather in Portugal, so I imagine the answer would be about the same – end of September, early October! Thanks for that intel! As I say, Spain and Portugal are really the highest on the list of places we want to go but have never visited… Italy just keeps getting in our way! 🙂 Looking back again on this, I just dream of taking that walk to San Juan de Gaztelugatxe. Stunning! Wonderful recounting of your Basque travels Karen!! We lived in Spain 12 years and only traveled though that area a few times– on our way north to France. Bilboa is an amazing mix of traditional and modern. And your pintxos photo made me a little jealous! So glad to see this post– just beautiful! thanks! Hi Ronda, I’m glad that you enjoyed the post on the Spain Basque Country and that it brought back nice memories of your years spent in Spain. That had to be a wonderful experience. Basque country is SO pretty! Neat area of the world — and I loved the Guggenheim. Such a neat building. Hi John, The Basque Country is definitely an area I would love to return to…may next time on a road trip. Great post. This is the area where I would love to visit someday. Thank You.